USS Olympia, a protected cruiser built 1891-93 at the Union Iron Works in San Francisco, now lies at her permanent berth in Philadelphia. 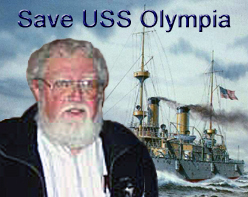 The 6,600-ton Olympia was part of the "New Navy" of modern warships which rejuvenated the U.S. fleet following a post-Civil War era of corruption, inattention and decay. Denoted C-6 (Cruiser #6), she came right at the beginning of this resurgence, along with the Maine and the 1895 Texas. She is one of the very few early steel warships preserved in the world today. Olympia is a graceful, balanced vessel, as evident in her plans and a vintage 1898 shot. As the flagship of Commodore George Dewey at the Battle of Manila Bay, in which the U.S. laid its claim to the Philippines within days of declaring war on Spain in 1898, Olympia iced her own claim to fame: Dewey's footsteps, cast in bronze, stand on her bridge to this day. The cruiser carried four 8-inch guns in twin turrets fore and aft, a mixed armament (ten 5" and smaller calibres) in casemate mountings and sponsons on the hull, and 2 torpedo tubes. Olympia had a 40-year career in the Navy and coast defense before becoming a museum ship in Philadelphia. The ship's charter from Congress was to be built entirely by American industry and in general she was a credit to her makers. However, there were a few awkward features. As originally built, Olympia used a steam-operated training gear for her 8" turrets (as did the Oregon and other American contemporaries). This system lacked fine control, making it very difficult to train the 8" guns accurately. In target practice the gunners would send the turrets around in a wide arc and fire as the guns bore. At Manila Bay, the ship did most of her fighting with her 5" battery, although illustrators of the day concentrated on the allure of the big guns. Post-1898 a more satisfactory electrical training system was installed, copying the successful original installation on the USS Brooklyn. Another design note was the experimental use of cofferdams in the sides of the hull, packed with cellulose; this was meant to provide lightweight anti-flooding protection. Also, coal bunkers were sited along the ship's sides to absorb enemy shot; this proved potentially dangerous as coal was prone to spontaneous combustion; it is thought that a bunker fire next to a magazine may have caused the destruction of the battleship Maine. Neither the cellulose nor the coal proved to be much use as protection, though fortunately the ship survived her bouts of battle without serious damage. No matter: Dewey was inflated into a first-class American hero by the "Yellow Press" and politicos, and the Olympia and her Captain Gridley shared the limelight. Coming only days after the declaration of war, the Manila Bay victory etched itself on the national consciousness in vivid colors. Consequently the ship has been quite well cared for by the Cruiser Olympia Foundation and Independence Seaport Museum.